In 1968, the National Gallery of Victoria held its inaugural exhibition at its new location in St. Kilda Road, Southbank. The impressive new gallery, designed by the leading architect Roy Grounds (1905-1981), was opened by Sir Henry Bolte (1908-1990) on the evening of Tuesday 20 August 1968. The much anticipated and heavily advertised inaugural exhibition, opened on the following evening by Norman Reid, the Director of London’s Tate Gallery from 1964 to 1979, was entitled The Field – it was an exhibition of seventy-four works by forty young Australian artists. Not one artist of Williams’s generation was considered for inclusion and the rebuff sent a deep shudder through Melbourne’s art world. The twenty-five year old Patrick McCaughey, the newly appointed art critic for Melbourne’s The Age newspaper, made matters worse by writing an enthusiastic review that rashly dismissed all earlier modernist aspiration in Australia as inept. A livid artistic controversy arose and probably did something for the attendance figures – an amazing total of 100,000 viewers turned up on the following weekend, some no doubt to take in the new building, while others came to see what all the fuss was about. The exhibition was an important and pivotal event. Dr. Christopher Heathcote, an art historian and former art critic for The Age newspaper, in the conclusion of his scholarly book A Quiet Revolution, The Rise of Australian Art 1946-1968, cogently claims that the exhibition changed Australian art forever in that it institutionalised modern art and made it a product of a mandarin culture – importantly, he states that ‘imagination and inventiveness had been reconfigured’.1 Heathcote is right – art had changed. Painting in the supposed forefront in the mid to late Sixties now stressed surface flatness and disengagement from the world of appearances and things. Artists became more fully engaged with the making of a work of art with simple and stripped down visual essentials while paying closer attention to the actual physical surface of the paintings. They adopted a non-recessional, non-illusionistic approach and saw contemporary painting as essentially being a flat picture plane, which did not pretend to present a view, express anything or offer up a picture of the world. For these artists the common opinion was that contemporary painting was in essence about form as a planar-based arrangement of shapes, patterns and colours. Painting now had to be about painting. It was seen as being self-referential and not concerned with anything other than its own innate qualities and attributes. In this new schema, painting had to concern itself with only that which belonged to painting – that which arose from the medium of oil paint and did that which only oil paint could do. Subsequently, narrative and story-telling disappeared from painting as it was seen to properly belong to literature, suggestions of space went as they belonged to sculpture, line went as it was the province of drawing and calligraphy, gesture and expression were jettisoned as they belonged to theatre and naturalism was dropped as it belonged to photography. Thus, what emerged was a reductive and minimalist art that rested upon restrained composition, washes of colour, flat fields of paint, stained canvases, patterning and geometric grids. (born 1928), George Johnson (born 1926), Roger Kemp (1908-1987), James Meldrum (born 1931), Lawrence Daws (born 1927) and Robert Juniper (1929-2012), who rode this new wave produced paintings that were vastly different in style, yet their paintings share some common broad-brush attributes. For instance, they all tended to unite landscape or bush imagery with semi-abstract or simplified forms and they used non-recessional space that did not present a ‘view picture’ with illusionistic space. In addition, as a way of distancing themselves from tradition they were not wedded to nationalistic, rural or pastoral themes, nor were they prompted by questions of national identity. All these attributes and factors are present in the paintings of Fred Williams. The point of this longish preamble is to place Williams and his late Sixties work into the appropriate aesthetic and historical context. The general trend towards a stripping away form of artistic minimalism was not lost upon Williams and there is no doubt that he was fully aware of its aesthetic significance. Not only was he highly visually aware of the implications of The Field exhibition, but a move to greater simplification and abstraction was already evident in his own paintings, especially from the visual evidence presented by his justly famous You Yangs and Lysterfield series of 1965. This is quite evident in the large and highly accomplished oil painting Triptych Landscape, also known as Lysterfield Triptych, of 1967-68 in the collection of the National Gallery of Australia in Canberra. The over four metre wide triptych presents a horizontal expanse of what can barely be read as a landscape. The background of this expanse is almost unmodulated in tone and exists as a flat plane for the placement of variegated and almost calligraphic streaks and daubs of paint that stand up from the surface of the canvas. Importantly, it is worth noting that the painting moves from a relatively densely populated left hand panel, through a moderately dense middle panel, to a sparse right side panel. It is safe to surmise that Williams painted this right side paint last as it shows the greatest economy of form. This supposition is supported by the pictorial characteristics of Williams’s later painting Yellow Landscape of 1968-69, in the collection of the Geelong Art Gallery. Yellow Landscape shows an almost two metre span of carefully placed daubs and slashing verticals placed upon a modulated opaque horizon-less ground of yellow, ochre and sienna tones. The pictorial space is shadowless and visually dense. At the time many abstractionist artists thought of painting as what they called ‘mark making’ and the calligraphic deftness of Yellow Landscape suggests that Williams shared this view. The painting Yellow Landscape is very close in its visual attributes and sparseness to the right hand panel of Williams’s Triptych Landscape, painted a year earlier. Taking the two paintings together makes it obvious which direction Williams was moving in from 1965 to 1970. 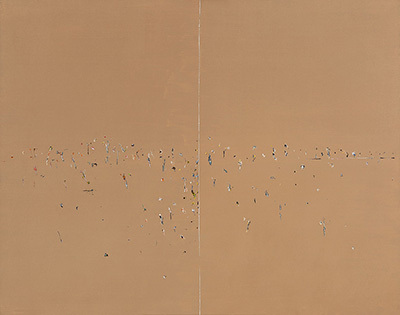 It becomes clear that Williams’s aesthetic direction was shifting away from the sophisticated techniques, colouristic effects, translucent ground and the late Cubist compositional structures of the magisterial Upwey series of 1965 and toward the pared down quality, opaque grounds and optical sparseness of his Australian Landscapes series of 1969 to 1970. One sees this very clearly in the reductivist qualities of Williams’s paintings Australian Landscape II of 1969 and Australian Landscape I of the same year. Williams’s painting Australian Landscape I of 1969 is one of the finest of his Australian Landscapes series of that year. At the time Williams was of the opinion that somehow one could get to the essence of all Australian landscapes and paint emblematic works that embodied the distinctiveness of the land. What emerged were macroscopic paintings much informed by views from aircraft and characterised by harshly simplified vistas and a sense of largeness that related to the immensity of the Australian landscape. Gone were the closed and curtain-like qualities of his Upwey Landscape series of 1965. All of the paintings in the Australian Landscape series display vertical lines, in Australian Landscape I the line is placed centrally, that divide the canvases into pictorial zones. Interestingly, one can see how acutely aware Williams was of compositional proportions and placements when one realises that each of the two zones in his painting Australian Landscape I is made up of a vertical Golden Rectangle. The proportions of the two sections of the painting are based upon the famous Golden Rectangle or Golden Ratio, known to the Pre-Socratic Greek mathematician and philosopher Pythagoras (560-480 BC) but first published in the book Divina Proportione (Divine Proportions) in 1509 by Fra Luca Bartolomeo de Pacioli (1444-1514), who was Leonardo da Vinci’s mathematics teacher. A Golden Rectangle is formed by drawing a square, marking a midpoint on one of its sides and using it to describe an arc with the radius of the opposite corner. This arc is then used to extend an edge of the square to form a rectangle. The resultant rectangle has always been considered to have pleasing proportions and is famously used in the façade of the Parthenon in Athens and the United Nations building in New York, designed by the famous Brazilian architect Oscar Niemeyer (1907-2012). In Williams’s painting the Golden Rectangle gives the work a certain visual ‘fitness’ and compositional strength. These two tablets of form act as a solid field for the almost hieroglyphic globular daubs and vertical streaks of multicoloured paint, that refer to clumps of trees as seen from the air. The vertical line that appears in the Australian Landscape series was suggested, according to Professor Patrick McCaughey in his scholarly text Fred Williams 1927-1982 of 1980, by the lines of roads and fences seen from an airplane. There is much to suggest that this is absolutely correct. Yet, there are two other possibilities that may account for this unexpected feature in his paintings of the time. Williams was often in the habit of stringing wires, just clear of the paint surface, in rectangles from edge to edge to ensure that each zone of the painting possessed harmonious visual balance as he worked on it. It is possible that he noticed that, in some cases, the wire or its shadow acted as a pictorial element that added to the painting and decided to incorporate it as such in his Australian Landscape series. There is another enticing supposition. Williams after his 1967 trip to Tibooburra, near the borders of Queensland, New South Wales and South Australia, wrote the following in his notebook of 9 November: ‘The trip has been fascinating – it rather convinces me that there is something very similar running through the Australian landscape’. The next day he wrote ‘When we went to the ‘Tib’ I claimed that it was just the same as any other landscape but with the skin taken off’. Earlier in the same year on 25 January he had written; I suppose the most ‘universal’ picture is a map – it’s worth thinking about’.3 These thoughts of scale and sameness underscore the reductivist qualities and similaritities found in the paintings of the Australian Landscape series and mention of the map leads one to the supposition that their vertical lines refer to little more than the fold lines of travel maps. Williams’s highly refined visual acuity would have little trouble in melding all these factors together. Whatever the case, the vertical lines in these works segment the surface of the painting into fields that are read both together and separately as aesthetically successful pictorial screens. Fred Williams’s painting Australian Landscape I of 1969 is a highly refined and pictorially restrained work, with an impeccable exhibition history, which shows the forty-year old artist at his conceptual and lyrical best, thirteen years before his very much lamented and untimely death.